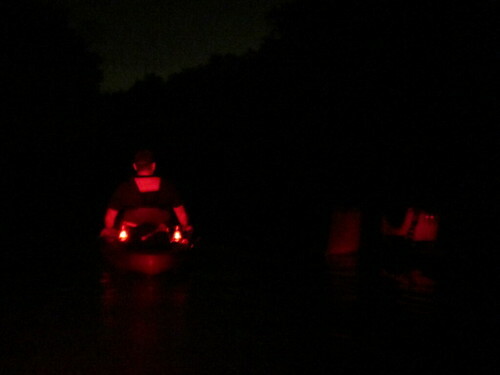 With a bit of moonlight glowing through cloudy skies, Saturday’s night paddle down Ward Creek and Bayou Manchac was quite a nice trip. After sunset, even the mosquitoes seemed to make way. 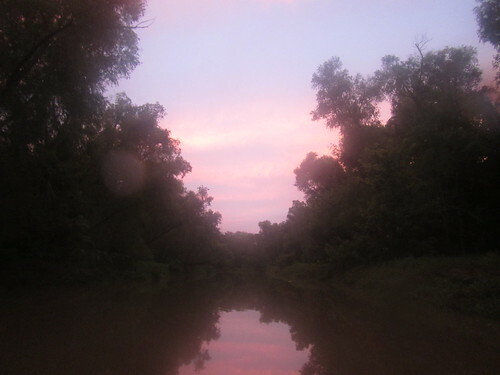 After the morning’s expedition on Bayou Fountain, a nice relaxing downstream trip seemed just perfect. With Jonathan again providing post-trip shuttle service, it was as easy as meeting at the launch point and enjoying the run. I arrived at South Mall Drive a bit before 6:30pm, set out the PaddleBR signs, and started getting everything ready. Around 7:30pm, we all launched and headed down Ward Creek with a beautiful evening sky above us. The only otter we saw this time was Jonathan’s bright little kayak. 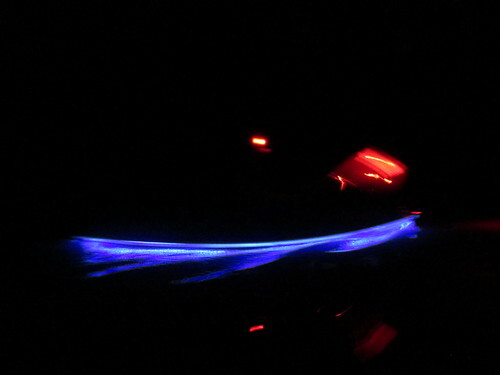 He had the latest version of his LED lighting on it, but the controller wasn’t cooperating very much. It didn’t want to give him plain red lights, so most of the time he kept it off. He did turn it back on for a bit so I could attempt to snap a few photos (considering his was the only lightboat out there). 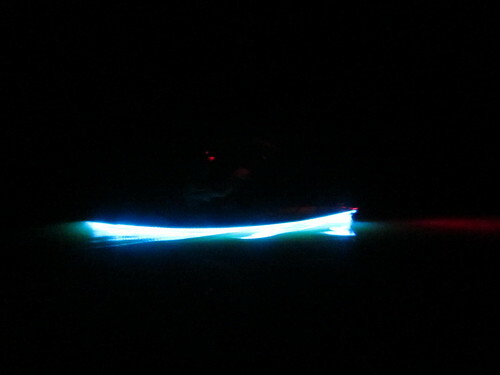 With some moonlight, albeit scattered by clouds and filtered by trees, it was a rather interesting paddle. 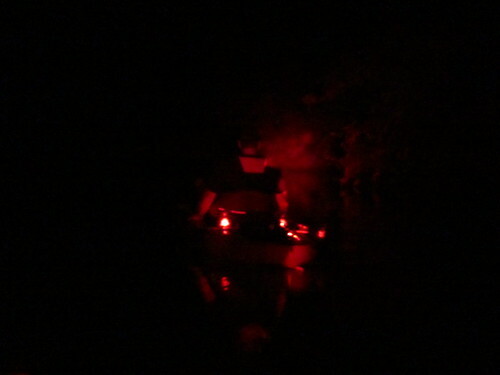 It was not the darkness of a new moon paddle, where you need lights to keep from running into the bank, and it wasn’t the brightness of a full moon paddle, where you need sunglasses or a hat. It was something in between, and a rather nice trip, indeed. With a long, skinny kayak (I need to get one of those) and a pedal kayak setting the pace, and with some current behind us (but not like it would be during a thunderstorm), we made quick work of the eight-mile run. A mere two and a half hours after we started, we were back on land at Camp Drive. Those of us shuttling loaded our boats on the trailer, and then we all piled in for the ride back to the car. It was the end to a full and fun day. Now to look forward to next week’s fun paddle.